Track your digital marketing performance across multiple channels, such as website, email, advertising, and social media. Find out how to find your website homepage page path in Google Analytics. Find out why there's a blank space in the Awareness Klip. Login credetials for your Twitter, Facebook and Google Analytics accounts. Concerned about privacy? See Why does Klipfolio need specific permissions to connect my service accounts? The Google Analytics page path for your website homepage. 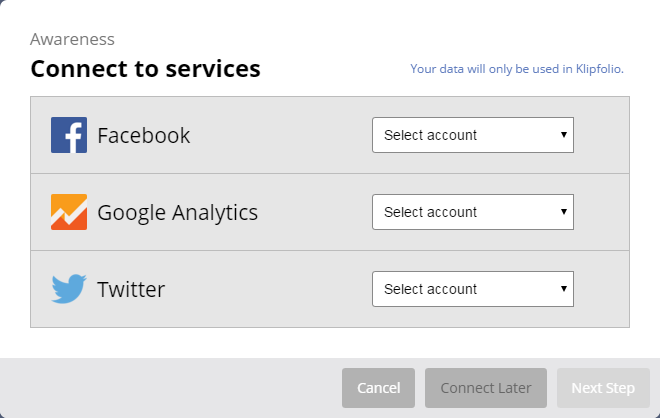 Log into services like as Facebook, Google Analytics and Twitter Connect an account or Select an account. Having trouble? See Problems adding Web Metrics Klips. 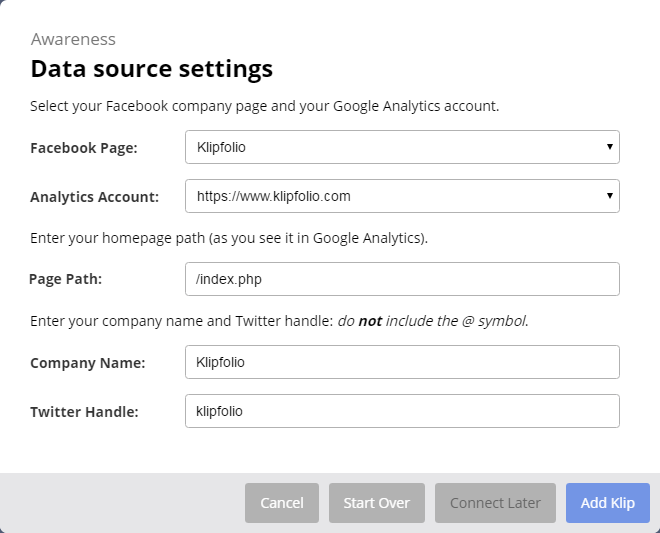 Select a Facebook company page and a Google Analytics account from the drop-down list. Enter the Page Path you see in Google Analytics that leads to your website home page.. Enter your company name and Twitter handle with no @ symbol. There are two ways you can find your home page path in Google Analytics. If you have set a Default Page, copy your website home page path. If you haven't configured your Settings yet in Google Analytics, you can find your home page path by looking through your site content. The best place to look is under Behavior > Site Content > All Pages. Home page paths can take different forms, such as /hc/en-us, /home.php, and many more variations. Click the small icon next to a page path to confirm that it leads to your home page. Copy your homepage path and paste it into Klipfolio. As you look at the Awareness Klip, you may be wondering, why is there missing data? In order to make this Klip easy to add, we are using free services. Some of these services do not provide historical data. If you would like data in those blank spaces, we recommend that you try some paid tools like Quintly and Talkwalker. These tools can start collecting your data so that it can be analyzed as historical data.